of food, wine, music, and merriment at our annual gala. Hosted by Christopher O’Riley, the evening will include a cocktail hour, dinner, and dessert prepared by City Winery chefs, and performances by some of the best young musicians in America. 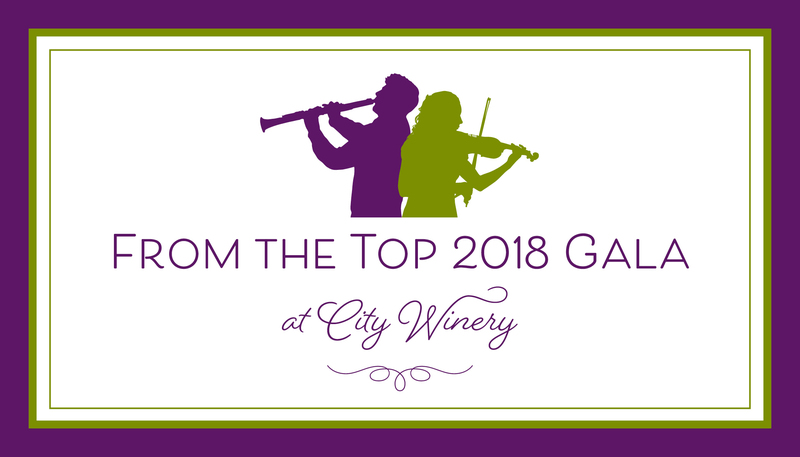 For more information about tickets and sponsorships, please click here or contact Rebecca Reiner at rreiner@fromthetop.org or call 617.437.0707 x120. Portions of this evening will be recorded for later broadcast. All proceeds will support From the Top’s education, outreach, and media programs. Cynthia and Oliver Curme/The Lost & Foudation, Inc.
City Winery, which opened in November 2017, is one of the most exciting new concert venues in Boston, and strives to deliver the highest-end combined culinary and cultural experiences. A stage that has hosted artists such as Art Garfunkel, Richard Shindell, and Rufus Wainwright will now host some of America’s best young classical musicians.